sauté your onions, with the garlic, chopped coriander stalks, bay leaves and ground cumin and coriander over a medium heat, with plenty of olive oil. Whilst this is slowly cooking, blanch your tomatoes in very hot water and leave for 5 minutes. Take out and plunge into cold water and remove the skins, dice the flesh and set to one side. When the onion mixture starts to go translucent, and begins to caramelise- add the remaining ingredients, season well. If the tomatoes are out of season add a tsp of sugar. Cook down for 45 min-1 hour. Whilst this is cooking- making your meat ball. In a large mixing bowl add the minced lamb. With clean hands add the remaining ingredients and mix well with your hands, season. Make bite sized balls, we like making them a more oval shape. And start putting onto a plate. Get a frying pan good and hot (before smoking), add a little olive oil, add your balls one by one. Make sure they get crisped all over. A few minutes on each side. Then take out of the pan and add to kitchen paper. One the sauce has cooked down, you still want the sauce to be loose- so add more stock or water if needs be- add the balls to the sauce. Mix in the orzo. 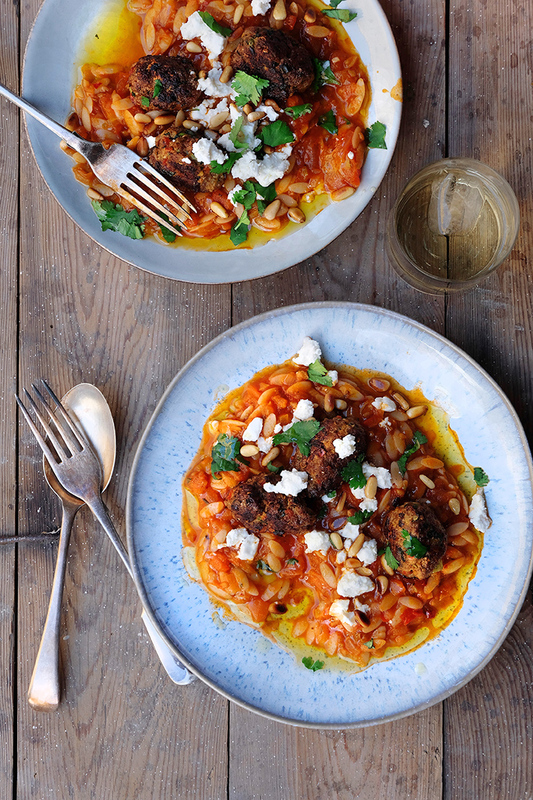 Serve up with crumbled feta, toasted pine nuts and chopped coriander. We recommend very good quality olive oil drizzled over.